Tenn. Awaits Tons Of German Nuclear Waste The Nuclear Regulatory Commission approved a plan for an American company to burn German nuclear waste in Oak Ridge. Though opponents worry about safety procedures, residents don't seem concerned. Radioactive residue left over from the process will be sent back to Germany for disposal, but opponents have voiced concerns that the U.S. will become the world's radioactive waste processor. But, very little of that opposition is coming from Oak Ridge. 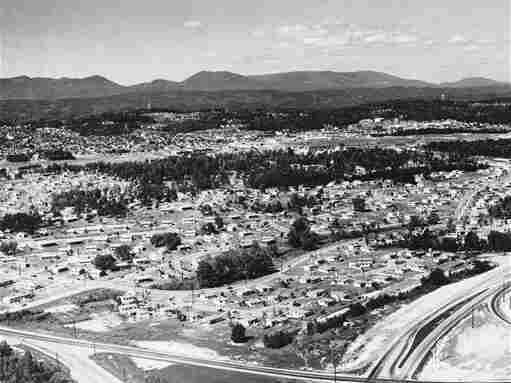 Located just outside Knoxville, Oak Ridge was created from scratch in 1942 to help build the atomic bomb. The city is home to a 59,000-acre military area and two giant plants where the bomb was produced. A post-war newsreel calls Oak Ridge "a city where 75,000 people worked in absolute secrecy on history's most sensational secret." In the years since that newsreel was produced, the city has become a world-renowned center for nuclear research. But, operations here also generate a great deal of radioactive waste. Some of that waste ends up at EnergySolutions' Bear Creek incinerator plant in Oak Ridge. On an asphalt lot between fences topped with razor wire, trucks rumble in and out of the plant, leaving behind giant dumpster-sized boxes full of low-level nuclear waste. "This is definitely typical," EnergySolutions' Greg Lawson says. "It's in and out all day long. I don't know the average number of shipments in and out, but there's a lot going on every day." Lawson says the plant has been safely burning low-level waste from Oak Ridge and other parts of the country for 20 years now. They've even imported waste from Canada and the United Kingdom before. But, a recent deal with a German company to burn up to two million pounds of their waste got the attention of environmental and watchdog groups. One is the Local Oversight Committee in Oak Ridge, a collection of experts and residents who monitor nuclear activity in the area. The committee hasn't decided whether it will oppose the plan, but director Susan Gawarecki says the fact that the waste is foreign raises some questions. "When you're starting to talk about managing the rest of the world's waste, the German waste looks like the beginning of what could be a large flood of material from other countries," she says. Don Safer of the Tennessee Environmental Council worries about the same thing. After the Fukushima disaster in Japan, he's not ready to accept any of EnergySolutions' guarantees that the process is safe. "There's a lot of controversy in burning regular garbage, let alone radioactive garbage," Safer says. What is most baffling to Safer is the fact that Tennesseans don't seem too bothered by it — especially in Oak Ridge. "I think first and foremost, Oak Ridge has been a company town for a long time and there's just a great reluctance — and almost a social convention — that you don't attack the company that feeds us all," he says. Oak Ridge City Manager Mark Watson prefers to look at it from a different perspective. He says there are a lot of scientists and workers living in Oak Ridge who deal with radiation every day. As a result, they have a pretty sophisticated familiarity with it. "There's a fear factor that may be missing from the folks who live here because we understand it a little bit better," Watson says. "And I think that we see some advantages for us as a community to be able to process that." EnergySolutions officials say they don't know when the first shipments of German waste will arrive in Oak Ridge, but it could be as early as this year. If opponents are hoping to derail the plan, they may not have much time.